Last Thursday, we spent Thanksgiving in the beautiful home of our aunts, in Santa Ynez, CA, a little further north of Santa Barbara. We love visiting them, and doing so for the Thanksgiving feast is a double pleasure. To contribute to dinner we were asked to do the Oreo place cards (we made them last year too), and bake the pies as usual (that has become my specialty over the 10 years+ we’ve been spending Thanksgiving with them). Little Miss I and I got to work on the Oreo turkeys, as Aunt Beth got to work in the real turkey — a 18 lb beast that would feed our large party of 14; 11 adults and 3 children. 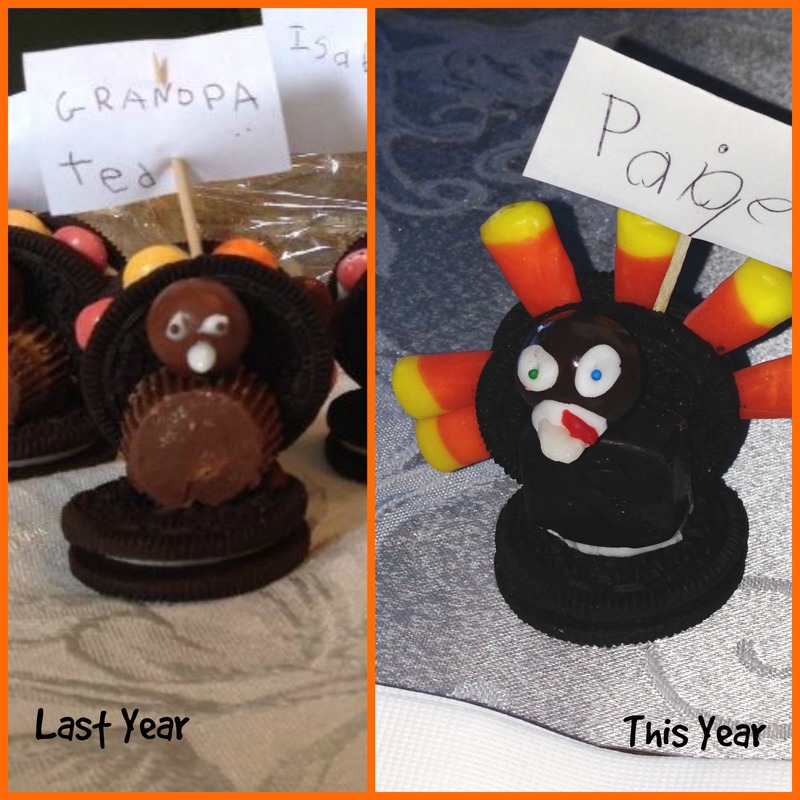 This year we made a few changes on our Oreo birds: I decided to do the bodies out of Dove Dark Chocolate, use pareils for the eyes, use Candy Corn for the feathers and beaks, and make my icing with pasteurized powdered egg whites. The powder egg whites for the Royal icing were great! Not only did they make the egg whites safer to eat, it also made the drying process super fast. I left the icing with a very thick consistency, so it was like sugary super glue. 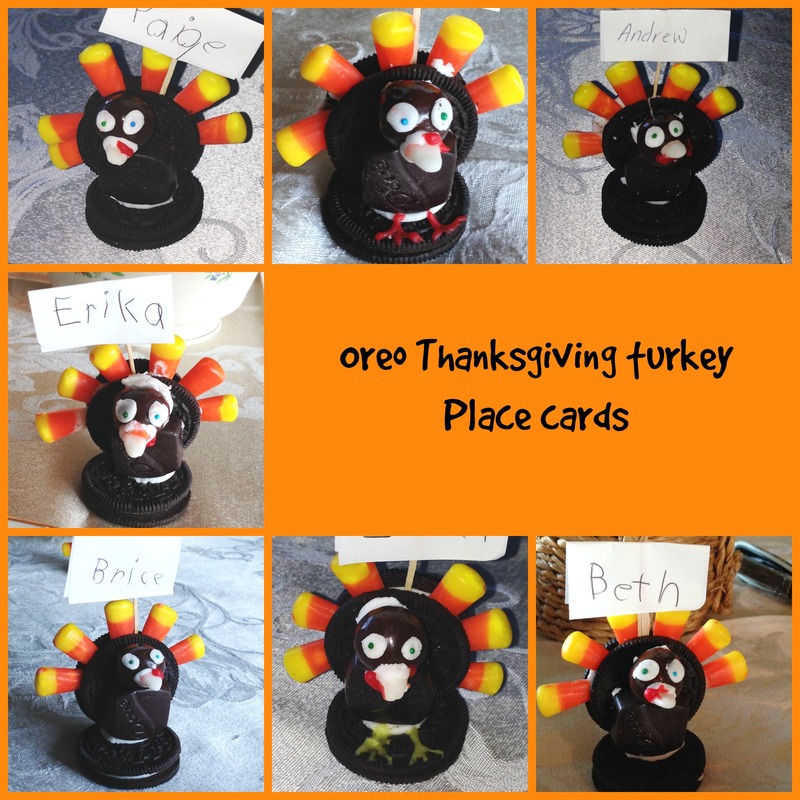 As soon as we were done with the Oreo Turkeys, I also decided to take some pictures of the food and table, as it always happens to me that we make these giant feasts and then there’s no one recording any of it in image! 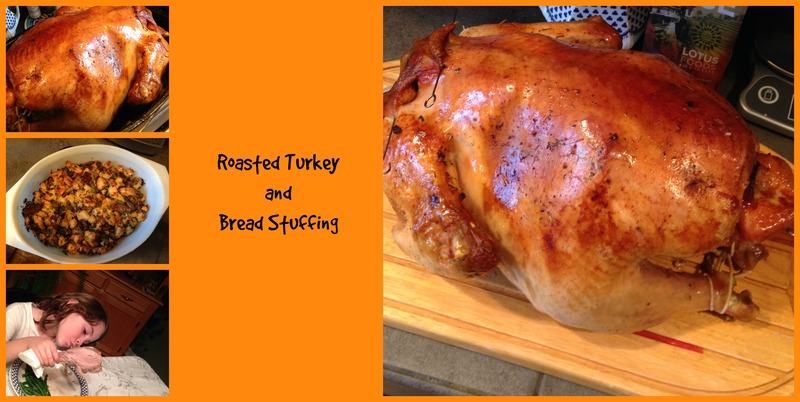 Therefore, here’s the Giant Turkey and the most delicious bread stuffing. The bird came out golden and moist, and ready to be carved and placed on the table. My little barbarian monster decided to go Viking and eat a turkey leg with her bare hands! 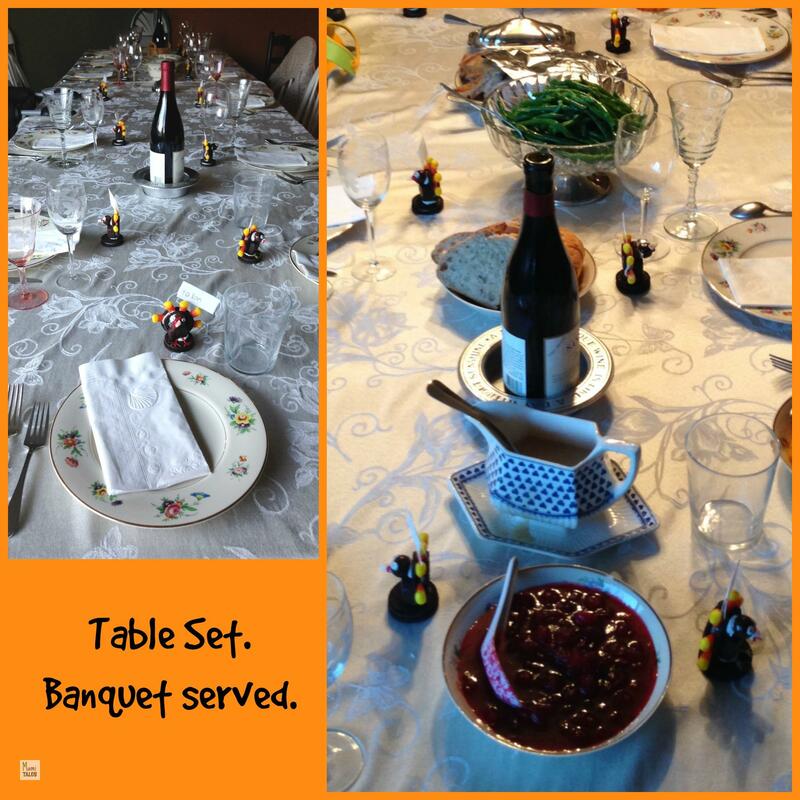 Here’s a picture of our table and the banquet all served and ready to be eaten. The China we used was my husband’s Great-grandmother’s. We had turkey, stuffing, sour dough bread, cranberry sauce, mashed potatoes (Aunt Paige’s specialty), butternut squash and green beans with a bit of butter. Everything was absolutely delicious! Finally came the pies, which we had made the day before. 2 apple and 2 pumpkin, because you can never have enough Thanksgiving pie! Everyone enjoyed the meal and dessert. We also had some chocolate chip cookies (Hillary Clinton’s recipe, as the baker noted), but I didn’t take pictures of that, unfortunately. Pies were served with fresh whipped cream and ice cream. 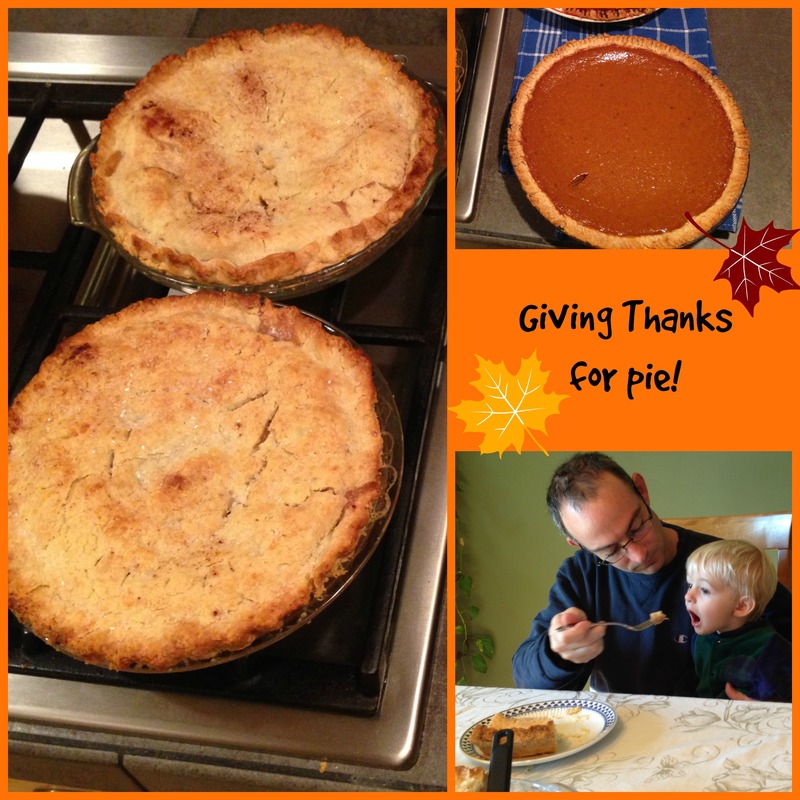 We had a fabulous time and a wonderful Thanksgiving meal surrounded by family, friends and 3 very hungry children. Who could ask for more? Tagged Baking and Cooking, Family, Menu ideas. It was fabulous indeed! Thanks for stopping by! I love those place card cookies, absolutely adorable. It looks like you had a great Thanksgiving holiday. Krista, they are super cute! That’s why we decided to make them again 😉 And my 6 year-old helped me put them together all the way. The only thing I did was put the eyes in. It was a great time with family and new friends.